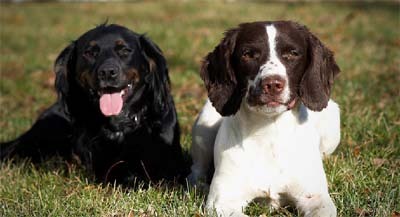 As a member of the English Springer Spaniel Field Trial Association, PrairieRose Gundogs is dedicated to the improvement of our hunting and Field Trial English Springer Spaniels & English Cocker Spaniels. The dogs and puppies you see offered here are the best of the best, field trial tested, championship spaniel hunting genetics. We actively participate in english springer spaniel field trials which enables us to select only the best family gundogs for our breeding program. We do this because we believe you 'want a great PrairieRose Gundog companion in your home, as well as a bird finder that has natural hunting ability and is easily trained. We know folks with great lines and we specialize in connecting you with dogs from the field trialers dedicated to the improvement of our lovable hunting spaniels. Most are avid field trialers or those who breed for field trialers. Please, stay away from the pet shops or online puppy markets who support puppy mills. Help us stop puppy mills - Go reputable, please. 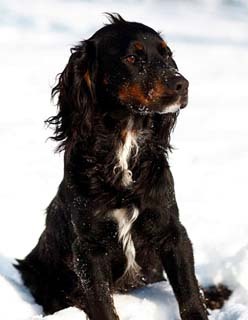 If 'you want to be assured of top level breeding for your field bred English Springer Spaniel puppy or English Cocker Spaniel puppy that hunt, are family lovers, and do it well, you found the place you were looking for. Phone: (507) 722-1504 - Please leave a message. See below for more info on Springers and English Cocker puppies. Millie is our English Springer Spaniel who is an Open All-age Field Champion, Amateur Field Champion, and Master Hunter titled at only three years of age. She flat out hunts, finds and retrieves birds as you would expect from an FC AFC, MH titled champion. Her Sire is Deepfeet Victor and Dam is Bucchleuchs Favor. Her Grandmother, Edwardiana Tweed is the International Field Trial Champion from Britain, bred with Clarburg Art (google it). For more information, pedigrees, English Springer Spaniel puppies for sale and dogs available - you want to click here. 2 British National Field Champions, Parents of Dam (NFC Timsgarry Barlow & NFC Willowbee Wren). We have an English Cocker Spaniel, Barley, (PrairieRose's Litomysl Barlow) at stud. His mother, Willowbee Wren is the 2005 British National Field Trial Champion and his father, Timsgarry Barlow is the 2007 British National Field Trial Champion. Barley is very stylish with a lot of heart and loves everyone. He is very willing to please and his natural hunting abilities are superb. If you are looking for both a lap dog and an outstanding pheasant dog, a true blueblood English Cocker spaniel out of Barley is right up your alley. 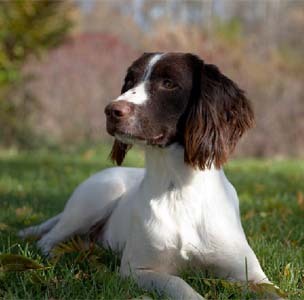 If you wish to purchase one of these high quality English Springer Spaniel puppies for sale, introduced youngsters, started spaniels or finished gundogs, and you are or want to be an upland bird hunter, waterfowler, field trialer, Agility or Dock diving enthusiast, you are exactly what we are looking for. We give preference on English Springer Spaniel puppies for sale to those of you who keep your new spaniel in the home and commit to providing stimulating activity for your new PrairieRose gundog. PrairieRose Gundogs are easygoing family dogs that become very powerful in the field. PrairieRose Gundogs on facebook - Click Here please.